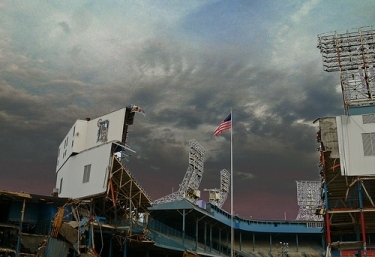 Like most really old baseball stadiums, Tiger Stadium was in fact a total dump. I mean, it was nice in its kind of tough, grimy way – how appropriate that it was in Detroit, itself the toughest, grimiest city in America. People talk about New York or Los Angeles, or maybe Chicago, but if you want the true American experience take a walk through Motor City. Any city can build a museum, but it takes someplace special to actually live and die. Pictures make some places famous, but its mortality makes Detroit the most human of those places. Sorry, I was here to talk about baseball, wasn’t I? I moved here to Chicago in 2002 from Sterling Heights, Michigan. Like most people from Michigan, I learned at an early age there wasn’t a whole lot to be had if you weren’t an auto engineer or if U of M or Michigan State didn’t want you for their athletic programs – and even if you were an auto engineer, there still wasn’t a lot for you. “Best to get out before you get stuck,” my father liked to say. To him, even the hotels in New York were better than the mansions in Michigan. I really came to like knowing there were others who’d made the leap, like I wasn’t the only person who left behind his town or his family because Detroit was lacking something. Some of the best friends I’ve made here are other refugees from the Wolverine State. We laugh a lot when other people are around, but when it’s just Michigan and Detroit folks we get more serious. We knew about Kwame before the New York Times ever got on his case, and you’d be amazed how fast auto industry news travels when everyone knows someone who’s about to lose their job. During one weekend in the 2006 season, some Michigan friends were in from back home – yes, some people honestly would rather stay – to see the Tigers at Wrigley. We went out early to the bars, had some drinks, got excited about how the Tigers were playing, remembered old times and old teams, and generally had the kind of fun you’re supposed to. It was summer, and this was just what we thought summertime in the city should be. Of course it did: only by leaving Detroit were we free to embrace it. Dave Willen still lives in Chicago but misses some things about Michigan and wonders how Detroit is doing these days.